Omega 6 fatty acids are essential for the protection of skin and endangered species. It is very important for our brain to run smoothly and reduce the risk of heart diseases. The amount of omega-6 required for males between 13 and 50 years of age should be 17 grams / day, for women it should be 12 grams / day.For the proper development of the body it is necessary to take in balanced amounts of omega 6 fatty acids. 1-Walnuts And Peanuts - The use of peanut is the right way to keep your hunger cool. ¼ cup peanut oil consumes approximately 4 grams of omega-6, which is responsible for healthy cells and good skin. Walnuts are also good sources of omega-6 fatty acids. You can get about 9 grams of omega-6 fatty acids from ¼ cup walnuts. 2-Use Olive Oil,Soybean,Sunflower - You can get around 7.7 grams of omega-6 fatty acids when you cook food by adding only 1 teaspoon soybean oil. One spoon olive oil gets 1.2 grams of omega-6 fatty acids. You will need to increase the amount of olive oil in your diet to get the appropriate amount for daily use. A spoon of sunflower oil gets about 10 grams of omega-6 fatty acids, and this oil contains more vitamin E and other nutrients. 3-Fish - Fish is the most suitable dish to get omega-6 fatty acids. 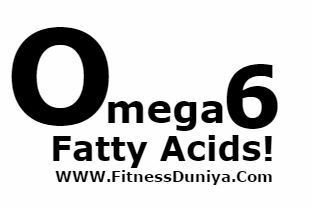 In an average size fish, 0.8 g omega-6 fatty acids are found. Therefore, fish feed during pregnancy is beneficial for the health of the child's brain. 4-Pumpkin And Sesame Seeds - Eating pumpkin seeds as a snack is also an easy way to get omega-6 fatty acids. Omega-6 gets 4.8 gms of ¼ cup of pumpkin seeds. Sesame seeds are known for the good source of iron, but omega-6 fatty acids are also found in good quantities. About a quarter cup of sesame seeds, omega-6 fatty acids, gets 5.3 grams.